Here is the extraordinary person who dedicated his life to teach the world about Krishna consciousness, ancient India’s most noble message of spiritual wisdom. In the last ten years of his life, in spite of his advanced age, Srila Prabhupada circled the globe twelve times on lecture tours that have took him to six continents. In spite of such a vigorous schedule, Srila Prabhupada continued to write prolifically. 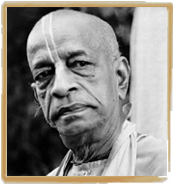 His writings constitute a veritable library of Vedic philosophy, religion, literature and culture.His Divine Grace A. C. Bhaktivedanta Swami Prabhupada was born in 1896 in Calcutta, India. He first met his spiritual master, Srila Bhaktisiddhanta Sarasvati Gosvami, in Calcutta in 1922. Bhaktisiddhanta Sarasvati, a prominent devotional scholar and the founder of sixty-four branches of Gaudiya Mathas (Vedic institutes), liked this educated young man and convinced him to dedicate his life to teaching Vedic knowledge in the Western world. Srila Prabhupada became his student, and eleven years later (1933) at Allahabad, he became his formally initiated disciple. At their first meeting, in 1922, Srila Bhaktisiddhanta Sarasvati Thakura requested Srila Prabhupada to broadcastVedic knowledge through the English language. In the years that followed, Srila Prabhupada wrote a commentary on the Bhagavad-gita and in 1944, without assistance, started an English fortnightly magazine. In 1968, Srila Prabhupada created New Vrndavana, an experimental Vedic community in the hills of West Virginia. Inspired by the success of New Vrndavana, then a thriving farm community of more than one thousand acres, his students founded several similar communities in the United States and abroad.In 1972, His Divine Grace introduced the Vedic system of primary and secondary education in the West by founding the Gurukulaschool in Dallas, Texas. 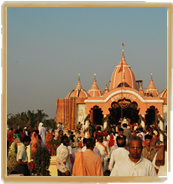 The school began with three children in 1972, and by the beginning of 1975 the enrollment had grown to one hundred fifty.Srila Prabhupada also inspired the construction of a large international center at Sridhama Mayapur in West Bengal, India, which is also the site for a planned Institute of Vedic Studies. A similar project is the magnificent Krsna-Balarama Temple and International Guest House in Vrndavana, India. These are centers where Westerners can live to gain firsthand experience of Vedic culture.Srila Prabhupada’s most significant contribution, however, is his books. Highly respected by the academic community for their authoritativeness, depth and clarity, they are used as standard textbooks in numerous college courses. His writings have been translated into eleven languages. 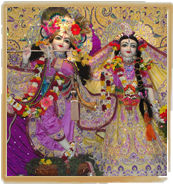 The Bhaktivedanta Book Trust, established in 1972 exclusively to publish the works of His Divine Grace, has thus become the world’s largest publisher of books in the field of Indian religion and philosophy. Srila Prabhupada wrote more than forty volumes of translation and commentary on such classics as Srimad-Bhagavatam (Bhagavata Purana), Chaitanya Charitamrita, and the Bhagavad-gita. He wrote not only as a scholar but as a consummate practitioner. He taught not only through his writings but by the example of his life. Throughout his works, Srila Prabhupada’s mood was to convey the natural meaning of the scriptures without far-fetched interpretations, giving us an authentic rendition of the Vedic conclusions on such important topics as the purpose of human life, the nature of the soul, consciousness, and God. One candlelight is able to light up countless other lights that will burn with equal strength, but nevertheless, one of them is the first. In the same way the Supreme Personality of Godhead expands Himself in unlimited forms, but still remains as the cause of all causes. In the Vedas this highest original cause is Krishna, because He has unlimited transcendental qualifications that attract every living being.A little over 500 years ago this same highest cause, Lord Sri Krishna, descended in the form of Caitanya Mahabrabhu. Lord Caitanya predicted that the song of His holy names – Hara Krishna, Hara Rama – would spread beyond the borders of India to countries and cities all over the world. Several hundred years passed by since Lord Caitanya’s faithful devotees endeavoured to spread out his teachings. They still wondered how and when this audacious prediction would be fulfilled.On the 13 August 1965, some days before His 69 birthday, A. C. Bhaktivedanta Swami left India for USA to explore what he could do to fulfil this prediction. He acquired a free ticket from a local shipping company and travelled aboard the small weather-beaten cargo ship, Jaladuta as the onlypassenger. His only belongings were a suitcase, an umbrella, a bag of grain, seven dollars in Indian currency, and a few boxes with books. When Jaladuta arrived at New York Harbour 37 days later Bhaktivedanta Swami was completely alone without supporters, experiencing fragile health and unclear about how to obtain His far-reaching purpose: to present the spiritual knowledge of the Vedas to the Western World. ”My dear Sri Krishna, You are very kind to this worthless soul, but I don’t know why you brought me to this place. Now you can do with me as you wish. How can I get them to understand the message of Krishna consciousness? I am very unlucky, unqualified and the most fallen person. Therefore, I ask for your blessings to convince them, because I feel powerless myself. Somehow, O Lord, You have guided me to this place to speak of you. Now, My Lord, my good and bad luck is up to you. Only through Your causeless mercy will my words bear fruit. I am sure that when this transcendental message enters their hearts, they will be filled with joy and be liberated from all material sufferings. O Lord, I am like a doll in your hands. If you have guided me to this place to dance, then let me dance, O Lord let me dance just like you wish”. This poem was written on the 18 September 1965. Only twelve years later, Bhaktivedanta Swami past away in India at the age of 81. What happened during these twelve years? What did Bhaktivedanta Swami accomplish in this short period of time? He started from scratch at an age where most people have retired. No matter which standard one uses His accomplishments can only be judged as remarkable. In short, A. C. Bhaktivedanta Swami, or Srila Prabhupada as his devotees began to call him, made the teachings of Lord Sri Krishna known in every major city all over the world and founded The International Society for Krishna Consciousness (ISKCON) with thousands of devotees. He established 108 temples on six continents and travelled around the world twelve times to educate his growing numbers of devotees. From the age of 70 until He reached 81, Srila Phabupada further translated, wrote and published 51 books in 28 languages. He gave thousands of lectures, wrote thousands of letters and talked to thousands of devotees and admirers as well as critics and opponents. He was highly esteemed and acknowledged among hundreds of prominent scholars and leading figures who valued His contribution to philosophy, culture and religion. The full story of Srila Prabhupada’s achievements during twelve short years exceeds by far the framework of this introduction, which in short will focus on his remarkable teachings and accomplishments. After His arrival in New York in September 1965 Srila Prabhupada fought alone for about a year to establish His Krishna Consciousness Movement. He lived as an ascetic, gave lectures whenever He had the opportunity, and gradually people began to gain interest for His teachings. 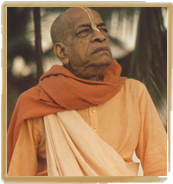 In July 1966 while He was still working alone from a small shop in New York’s Lower East Side, He founded ISKCON. 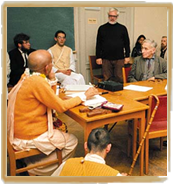 In the beginning its first board members were volunteers from a small group of visitors who came regularly for Srila Prabhupada’s evening lectures. 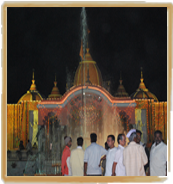 Today ISKCON consists of more than 300 temples, farms, schools and different projects all over the world with millions of devotees. Krishna consciousness is not a sectoral religion, but based on India’s old practical knowledge on spiritual values that are fully explained in the Vedic literature. The purpose of the Krishna Consciousness Movement is to give all human beings knowledge of this universal method to God realization and have them enjoy spiritual understanding, harmony and peace. The Vedic scriptures recommend that the most effective way to self-realization is always to hear of, speak about and remember the Supreme Personality of Godhead who is known by many names. One of these names is Krishna, which means “He, who is all attractive”, another is Rama, “He, who is the source of all joy”, while Hare indicates the Lord’s incomprehensible power and energy. In accordance with the Vedic recommendation the members of ISKCON are always singing or reciting the Hare Krishna Maha Mantra: Hare Krishna, Hare Krishna, Krishna Krishna, Hare Hare / Hare Rama, Hare Rama, Rama Rama, Hare Hare. This outstanding song brings one in direct contact with the Supreme Personality of Godhead. It is through His holy names by which a person gradually awakens to his original relationship with God. ISKCON’s most important mission is to urge all people to devote at least some of their time and energy to listen, to talk and to sing of God. In this way they will gradually realize that all living creatures are spiritual souls whose nature is to be forever connected with The Supreme Personality of Godhead through devoted service and love. Together with education in Vedic knowledge and propagation of the recitation of the Lord’s holy names, ISKCON also distributes free vegetarian food all over the world. This food is called prasadam. Food that is offered to the Lord cleans one’s heart and mind and advances one’s original God consciousness. ISKCON’s distribution of prasadam, known all over the world as Food for Life, therefore benefits both the body and the soul of the recipient. Among all that he gave, Srila Pranhupada considered his books the most important. He often referred to his translation and explanation of the Vedic scriptures as his life and soul. In 1970 Srila Prabhupada founded the Bhaktivedanta Book Trust, which is now the world’s largest publisher of Vedic literature. Now millions of people have read at least one of Srila Prabhupada’s books and felt a genuine enrichment of their lives. There are many forms of life on this planet – from immovable species like trees and plants to a widespread spectrum of insects, birds and mammals. Human beings are also among these manifold life forms, but even a superficial observer will have to admit that we human beings have a unique capacity that makes us different from all others. What is this unique capacity?We can begin to answer this question by asking another question. What separates a living form from a non-living form? The answer is consciousness. All living forms show more or less consciousness. Therefore we call them living and not dead. Even the smallest germ or house plant show signs of consciousness, whereas our dining table or chairs do not. It is also obvious that different forms of life show different degrees of consciousness, and that the human form of life represents the highest developed consciousness we know. Thus, it is this highly developed consciousness that distinguishes the human being from other forms of life on this planet.But in what way does our consciousness differ from the consciousness of the insects, the birds, the animals or even the apes? These beings eat, and so do we. They sleep, and so do we. They reproduce, and so do we. They defend themselves, and so do we. To carry out these functions in a more sophisticated way could indicate a higher consciousness, but actually it does not grant our advantage full justice. Our real advantage is rather our ability to ask questions about our existence reflect on ourselves and study our own and God’s nature. We are able to create languages, wonder about the meaning of life, be confused and wonder at the night sky. Other forms of life have no such gifts. The Vedas therefore advise us that we, in this human form of life, should find out who we are, what the universe is, what is God, and what is the connection between ourselves, the Universe and God. We should investigate if there is a solution to the real problems of life, namely birth, death, old age and disease. Questions like these are not raised by dogs and cats, but they should emerge in the hearts of all people. When we accept the importance of a search like this, the next question is, of course, where one finds definitive answers to such question? If perfect knowledge about the self, the Universe and God exists at all, it must naturally be more than just your or my opinion. Or for that matter Freud’s, Einstein’s or the opinion of anybody else.As we all have imperfect senses and are inclined to be mistaken, our relative opinions on what is situated outside of our experience, will not give us perfect knowledge.Our attempt to get empirical answers to these questions is incomplete and will ultimately fail. Therefore, so-called truths, which are no more than subjective speculations, will not help us to understand the absolute truth, which is situated outside the reach of our incomplete mind and senses. The Vedas explain that if we want to acquire what is situated outside of human perception and acknowledgment, we must learn it from somebody who already knows. The transcendental knowledge of the Vedas was first given by the Supreme Lord Himself. The Lord cannot be influenced or subdued by any other power. Therefore, logically, His knowledge must be perfect. Anybody who passes on this knowledge without changing it gives the same perfect knowledge. We are obliged to accept this principle – at least theoretically – to understand the Vedic way of thinking. The point is that the perfect knowledge of the Vedas is preserved by an unbroken succession of spiritual masters. Srila Prabhupada represents such a disciplic succession. 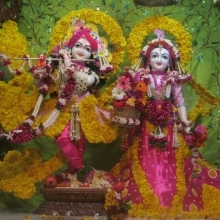 This succession goes back thousands of years to the time of Lord Krishna Himself. Thus, the knowledge in Prabhupada’s books is not different from the knowledge that The Supreme Lord gave in the beginning. Srila Prabhupada did not fabricate ”truths”. He just gave the original timeless knowledge of the Vedas without additions, omissions or alterations. Srila Prabhupada’s works mainly consist of Bhagavad-gita, Srimad-Bhagavatam and Caitanyacaritamrta. Together these literary works make more than 50 volumes of detailed knowledge that contain the original Vedic science to realize God or bhagavata-dharma. Srila Prabhupada’s translation of these into English with His detailed explanations is the most important contribution to the spiritual, intellectual and cultural life of the world. The Vedic teachings as it is presented in Srila Prabhupada’s books are summarized in three categories which in Sanskrit are called sambandha, abhidheya and prayojana. Sambandha means our relationship with God, abhidheya means to act in this relationship and prayojana aims at the final goal or perfection. These categories are universal and they are shared by all religions.The knowledge described in Prabhupada’s books enables anyone to make progress in realizing God without changing one’s religious, national or cultural affiliation. The science of how to realize God, the relationship with Him and the developing of love to Him cannot be sectarian. These are aims that no religion in the world can deny. In other words, they are the essence of all religions or the common denominator that are of universal validity, and through which all religions are understood.Whichever of God’s holy names one prefers can vary from one religion to another, and forms of worship, rituals and doctrines can also be different. The vital importance is, however, how much the devotee is in fact developing knowledge of and loves of God. True religion is to develop love of God. This subject is essential in all of Srila Prabhupada’s books. Without exception, all material phenomena have a beginning and an end. In the modern culture there is widespread opinion that consciousness is a material phenomenon. Therefore it is believed that consciousness (or the self) ceases to exist at the death of the material body. However, this is only an assumption and has never been proven by any observation or scientific experiment.Nevertheless, the idea that the self ceases to exist with the death of the material body is one of the most important articles of faith in the modern materialistic way of thinking, and most people are brought up to perceive themselves in that manner. However, only a few have realized the philosophic consequences of this way of thinking which unconsciously drags us into a senseless and nihilistic ways of living.The fundamental principle of Vedic teachings is in direct opposition to the understanding of modern science concerning consciousness and life. According to the Vedas the consciousness of the individual does not depend on nuro-biological functions but exists as an independent reality. The presence in the body of a conscious viewer, who is always the same, even when bodily and mental conditions change indicates the existence of two energies: the spiritual energy represented by the conscious self, and the material energy represented by the temporary body. The Vedas tell us that the spiritual energy, characterized by consciousness, continues to exist even after the material body ceases to function. If we are eternal individual souls, only covered by different temporary bodies, it will imply that the best activity of charity to all mankind is the activity that will awaken our true spiritual identity and our slumbering relationship with God. This activity is called Krishna-consciousness. As it is neither glorious nor beneficial to anybody just to save a drowning persons clothes, it is neither glorious nor beneficial only to improve the conditions of the temporary material body, which in the end is predestined to get old, sick and die. ”Devotion to God is slumbering in all of us.… Therefore, we are to engage in activities that bring this divine consiousness to life. This is only possible by hearing and speaking about the divine activities of the Supreme Personality of Godhead. Any occupation that is not helping us to be attached to, listen to and speak about the transcendental message of God is simply a waste of time”. As the embodied soul continuously passes in this body, from boyhood to youth to old age, the soul similarly passes into another body at death. A sober person is not bewildered by such a change. In modern times the human being is so ignorant that he does not even understand that his body is changing minute by minute, and that the final change is called death. In this life a man may be a king, but in his next life he may be a dog according to his karma. The spiritual soul is in deep sleep because of the influence of the material nature. He is placed in one condition and shifts again to another. Without self-realization and knowledge this conditioned life will continue, and one falsely claims to be a king, a cat or a dog. These are only changes caused by the highest arrangement.